September is ‘Better Breakfast Month’, and there’s no better way to celebrate the occasion than enjoying the local Pacific Northwest specialties Judith is serving this fall at Clementine’s Bed and Breakfast. Some local ingredients you’ll find on her menu include salmon, crab, wild mushrooms, all kinds of berries, and fruits such as pear, peach, and apple. The menu changes daily, based on what is best in season. You’ll awaken from a refreshing night’s sleep to the delicious scents of scones or muffins baking and freshly ground gourmet coffee brewing. Choose from a selection of juices and coffee, a dozen kinds of teas, or Judith’s homemade hot chocolate while you watch breakfast preparations in the B&B’s gourmet open kitchen. Your first course features seasonal fruit from the area, perhaps baked pears or a plum or peach crisp garnished with vanilla yogurt. More of the Pacific Northwest’s autumn bounty inspires your main course. Some of Judith’s savory specialties include Dungeness Crab Eggs Benedict and a Spinach Frittata with Wild Mushrooms and Goat Cheese. 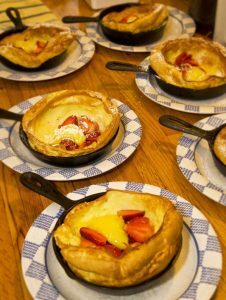 Oregon is famous for its fruits, so perhaps her Baked Stuffed French Toast with Caramelized Apples or famous Buttermilk Cornmeal and Oatmeal Pancakes with Oregon Blueberries will be on the menu. Baked treats such as petite raspberry muffins, scones, or buttermilk coffeecake complete your unique Pacific Northwest feast. You’ll never find a better place to experience the bounty of the farms, orchards, rivers and ocean that surround Astoria, and celebrate the ‘most important meal of the day’. Book your stay at our bed and breakfast, and you’ll enjoy Pacific Northwest breakfasts you’ll never forget any month of the year! This entry was posted on Saturday, September 24th, 2016 at 9:38 am and is filed under Clementine's Bed & Breakfast News. You can follow any responses to this entry through the RSS 2.0 feed. Both comments and pings are currently closed.